The SALTO key fobs we supply have built in authentication used to control and secure access to network services and data ensuring a high level of security within the building as well as preventing intruders from breaking in. They comes in a wide range of colours and designs in order to meet your needs, so you can opt for a fob that is easy to carry around the building or one with colours to match your outfit! The fobs can be linked with SALTO access control equipment you'll find featured in other sections of our website. So we are dedicated to making sure you get the product you desire in a high quality finish and at a competitive price. If you're looking for something different, maybe something more trendy? 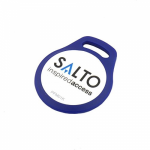 We can offer SALTO wristbands which are easy to wear or do you prefer something simple? We have SALTO cards available too.